Louisa May Alcott (/ˈɔːlkət, -kɒt/; November 29, 1832 – March 6, 1888) was an American novelist, short story writer and poet best known as the author of the novel Little Women (1868) and its sequels Little Men (1871) and Jo's Boys (1886). Raised in New England by her transcendentalist parents, Abigail May and Amos Bronson Alcott, she grew up among many of the well-known intellectuals of the day, such as Ralph Waldo Emerson, Nathaniel Hawthorne, Henry David Thoreau, and Henry Wadsworth Longfellow. Sleepy Hollow Cemetery, Concord, Massachusetts, U.S.
Alcott's family suffered from financial difficulties, and while she worked to help support the family from an early age, she also sought an outlet in writing. She began to receive critical success for her writing in the 1860s. Early in her career, she sometimes used the pen name A. M. Barnard, under which she wrote novels for young adults that focused on spies and revenge. Published in 1868, Little Women is set in the Alcott family home, Orchard House, in Concord, Massachusetts, and is loosely based on Alcott's childhood experiences with her three sisters. The novel was very well received and is still a popular children's novel today, filmed several times. Alcott was an abolitionist and a feminist and remained unmarried throughout her life. She died from a stroke, two days after her father died, in Boston on March 6, 1888. Louisa May Alcott was born on November 29, 1832, in Germantown, which is now part of Philadelphia, Pennsylvania, on her father's 33rd birthday. She was the daughter of transcendentalist and educator Amos Bronson Alcott and social worker Abby May and the second of four daughters: Anna Bronson Alcott was the eldest; Elizabeth Sewall Alcott and Abigail May Alcott were the two youngest. The family moved to Boston in 1834, where Alcott's father established an experimental school and joined the Transcendental Club with Ralph Waldo Emerson and Henry David Thoreau. Bronson Alcott's opinions on education and tough views on child-rearing as well as his moments of mental instability shaped young Alcott's mind with a desire to achieve perfection, a goal of the transcendentalists. His attitudes towards Alcott's wild and independent behavior, and his inability to provide for his family, created conflict between Bronson Alcott and his wife and daughters. Abigail resented her husbands' inability to recognize her sacrifices and related his thoughtlessness to the larger issue of the inequality of sexes. She passed this recognition and desire to redress wrongs done to women on to Louisa. In 1840, after several setbacks with the school, the Alcott family moved to a cottage on 2 acres (0.81 ha) of land, situated along the Sudbury River in Concord, Massachusetts. The three years they spent at the rented Hosmer Cottage were described as idyllic. By 1843, the Alcott family moved, along with six other members of the Consociate Family, to the Utopian Fruitlands community for a brief interval in 1843–1844. After the collapse of the Utopian Fruitlands, they moved on to rented rooms and finally, with Abigail May Alcott's inheritance and financial help from Emerson, they purchased a homestead in Concord. They moved into the home they named "Hillside" on April 1, 1845, but moved in 1852, selling to Nathaniel Hawthorne who renamed it The Wayside. Moving 22 times in 30 years, the Alcotts returned to Concord once again in 1857 and moved into Orchard House, a two-story clapboard farmhouse, in the spring of 1858. Alcott's early education included lessons from the naturalist Henry David Thoreau who inspired her to write Thoreau's Flute based on her time at Walden's Pond. Most of the education she received though, came from her father who was strict and believed in "the sweetness of self-denial." She also received some instruction from writers and educators such as Ralph Waldo Emerson, Nathaniel Hawthorne, Margaret Fuller, and Julia Ward Howe, all of whom were family friends. She later described these early years in a newspaper sketch entitled "Transcendental Wild Oats." The sketch was reprinted in the volume Silver Pitchers (1876), which relates the family's experiment in "plain living and high thinking" at Fruitlands. Poverty made it necessary for Alcott to go to work at an early age as a teacher, seamstress, governess, domestic helper, and writer. Her sisters also supported the family, working as seamstresses, while their mother took on social work among the Irish immigrants. Only the youngest, May, was able to attend public school. Due to all of these pressures, writing became a creative and emotional outlet for Alcott. Her first book was Flower Fables (1849), a selection of tales originally written for Ellen Emerson, daughter of Ralph Waldo Emerson. Alcott is quoted as saying "I wish I was rich, I was good, and we were all a happy family this day" and was driven in life not to be poor. In 1847, she and her family served as station masters on the Underground Railroad, when they housed a fugitive slave for one week and had discussions with Frederick Douglass. Alcott read and admired the "Declaration of Sentiments", published by the Seneca Falls Convention on women's rights, advocating for women's suffrage and became the first woman to register to vote in Concord, Massachusetts in a school board election. The 1850s were hard times for the Alcotts, and in 1854 Louisa found solace at the Boston Theatre where she wrote The Rival Prima Donnas, which she later burned due to a quarrel between the actresses on who would play what role. At one point in 1857, unable to find work and filled with such despair, Alcott contemplated suicide. During that year, she read Elizabeth Gaskell's biography of Charlotte Brontë and found many parallels to her own life. In 1858, her younger sister Elizabeth died, and her older sister Anna married a man named John Pratt. This felt, to Alcott, to be a breaking up of their sisterhood. As an adult, Alcott was an abolitionist and a feminist. In 1860, Alcott began writing for the Atlantic Monthly. When the American Civil War broke out, she served as a nurse in the Union Hospital at Georgetown, DC, for six weeks in 1862–1863. She intended to serve three months as a nurse, but halfway through she contracted typhoid and became deathly ill, though she eventually recovered. Her letters home—revised and published in the Boston anti-slavery paper Commonwealth and collected as Hospital Sketches (1863, republished with additions in 1869)—brought her first critical recognition for her observations and humor. She wrote about the mismanagement of hospitals and the indifference and callousness of some of the surgeons she encountered. Her main character, Tribulation Periwinkle, showed a passage from innocence to maturity and is a "serious and eloquent witness". Her novel Moods (1864), based on her own experience, was also promising. In the mid-1860s, Alcott wrote passionate, fiery novels and sensational stories under the nom de plume A. M. Barnard. Among these are A Long Fatal Love Chase and Pauline's Passion and Punishment. Her protagonists for these books are strong and smart. She also produced stories for children, and after they became popular, she did not go back to writing for adults. Other books she wrote are the novelette A Modern Mephistopheles (1875), which people thought Julian Hawthorne wrote, and the semi-autobiographical novel Work (1873). Alcott became even more successful with the first part of Little Women: or Meg, Jo, Beth and Amy (1868), a semi-autobiographical account of her childhood with her sisters in Concord, Massachusetts, published by the Roberts Brothers. Alcott originally delayed writing the novel, seeing herself incapable of writing a story for girls, despite her publisher, Thomas Niles' urges for her to do so. Part two, or Part Second, also known as Good Wives (1869), followed the March sisters into adulthood and marriage. Little Men (1871) detailed Jo's life at the Plumfield School that she founded with her husband Professor Bhaer at the conclusion of Part Two of Little Women. Jo's Boys (1886) completed the "March Family Saga". In Little Women, Alcott based her heroine "Jo" on herself. But whereas Jo marries at the end of the story, Alcott remained single throughout her life. She explained her "spinsterhood" in an interview with Louise Chandler Moulton, "I am more than half-persuaded that I am a man's soul put by some freak of nature into a woman's body. However, Alcott's romance while in Europe with the young Polish man Ladislas "Laddie" Wisniewski was detailed in her journals but then deleted by Alcott herself before her death. Alcott identified Laddie as the model for Laurie in Little Women. Likewise, every character seems to be paralleled to some extent, from Beth's death mirroring Lizzie's to Jo's rivalry with the youngest, Amy, as Alcott felt a sort of rivalry for (Abigail) May, at times. Though Alcott never married, she did take in May's daughter, Louisa, after May's death in 1879 from childbed fever, caring for little "Lulu" until her death. Little Women was well received, with critics and audiences finding it suitable for many age groups. A reviewer of Eclectic Magazine called it "the very best of books to reach the hearts of the young of any age from six to sixty". It was a fresh, natural representation of daily life. With the success of Little Women, Alcott shied away from the attention and would sometimes act as a servant when fans would come to her house. Louisa May Alcott's grave in Sleepy Hollow Cemetery, Concord, Massachusetts. Along with Elizabeth Stoddard, Rebecca Harding Davis, Anne Moncure Crane, and others, Alcott was part of a group of female authors during the Gilded Age, who addressed women's issues in a modern and candid manner. Their works were, as one newspaper columnist of the period commented, "among the decided 'signs of the times'". After her youngest sister May died in 1879, Louisa took over for the care of niece, Lulu, who was named after Louisa. Alcott suffered chronic health problems in her later years, including vertigo. She and her earliest biographers attributed her illness and death to mercury poisoning. During her American Civil War service, Alcott contracted typhoid fever and was treated with a compound containing mercury. Recent analysis of Alcott's illness, however, suggests that her chronic health problems may have been associated with an autoimmune disease, not mercury exposure. Moreover, a late portrait of Alcott shows a rash on her cheeks, which is a characteristic of lupus. Alcott died of a stroke at age 55 in Boston, on March 6, 1888, two days after her father's death. Lulu, her niece was only 8 years old when Louisa died. Louisa's last known words were "Is it not meningitis?" She is buried in Sleepy Hollow Cemetery in Concord, near Emerson, Hawthorne, and Thoreau, on a hillside now known as "Authors' Ridge". Louisa frequently wrote in her journals about going on runs up until she died. She challenged the social norms regarding gender by encouraging her young female readers to run as well. Her Boston home is featured on the Boston Women's Heritage Trail. Her childhood home Orchard House is now a museum that pays homage to Louisa May Alcott and her family that focuses on education. In addition, Harriet Reisen wrote Louisa May Alcott: The Woman Behind "Little Women" which later became a film that was directed by Nancy Porter and aired on PBS television. In 1996 Alcott was inducted into the National Women's Hall of Fame. There is a Part Second of Little Women, also known as "Good Wives", published in 1869; and afterward published together with Little Women. 5. Jimmy's Cruise in the Pinafore, Etc. 6. An Old-Fashioned Thanksgiving, Etc. Lulu's Library (1886–1889) A collection of 32 short stories in three volumes. Morning-Glories and Other Stories (1867) Eight fantasy stories and four poems for children, including: *A Strange Island, (1868); * The Rose Family: A Fairy Tale (1864), A Christmas Song, Morning Glories, Shadow-Children, Poppy's Pranks, What the Swallows did, Little Gulliver, The Whale's story, Goldfin and Silvertail. Spinning-Wheel Stories* (1884). A collection of 12 short stories. A Garland for Girls (1888). A collection of eight short stories. The Brownie and the Princess (2004). A collection of ten short stories. Transcendental Wild Oats (1873) A Short story about Alcott's family and the Transcendental Movement. 1933: Little Women, a movie version of the novel. 1934: Little Men, a movie version of the novel. 1940: Little Men, a movie version of the novel. 1949: Little Women, a movie version of the novel. 1949: An Old-Fashioned Girl, a movie version of novel. 1958: Little Women, a series based on the novel. 1970: Little Women, a series based on the novel. 1978: Little Women, a series based on the novel. 1981: Little Women, an anime based on the novel. 1987: Tales of Little Women, an anime based on Little Women. 1994: Little Women, a movie version of the novel. 1997: The Inheritance, a movie version of the novel, which was posthumously published for the first time that year. 1998: Little Men, a movie version of the novel. 1998: Little Men, a T.V. show based on the novel. 2008: An Old Fashioned Thanksgiving, a movie based on the short story. 2016: Google Doodle created by Google artist Sophie Diao. 2017: Little Women, a miniseries of the novel. 2018: Little Women, a movie version of the novel, set in modern times. 2019: Little Women, a movie version of the novel. ^ a b c Cullen-DuPont, Kathryn (August 1, 2000). Encyclopedia of women's history in America. Infobase Publishing. pp. 8–9. ISBN 978-0-8160-4100-8. 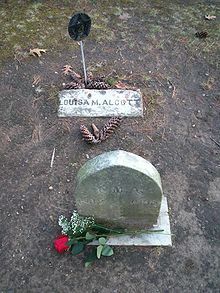 ^ "Louisa M. Alcott Dead". The New York Times. March 7, 1888. Retrieved April 2, 2018. The parents of the authoress removed to Boston when their daughter was 2 years old, and in Boston and its immediate vicinity she made her home ever after. ^ a b c d e f g Louisa May Alcott (1988). Showalter, Elaine (ed.). Alternative Alcott. Rutgers University Press. ISBN 9780813512723. ^ "Alcott: 'Not the Little Woman You Thought She Was'". Morning Edition. NPR. December 28, 2009. Retrieved April 2, 2018. ^ Cheever, Susan (November 2011) . Louisa May Alcott: A Personal Biography (1st ed.). Simon and Schuster. p. 45. ISBN 9781416569923. Richardson, Charles F. (1911). "Alcott, Louisa May" . In Chisholm, Hugh (ed.). Encyclopædia Britannica. 1 (11th ed.). Cambridge University Press. p. 529. ^ Reisen, Harriet (December 29, 2009). "Alcott: 'Not The Little Woman You Thought She Was'". NPR. Retrieved April 2, 2018. 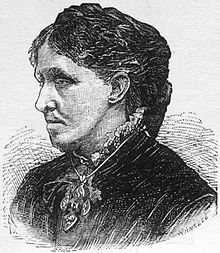 ^ "Louisa May Alcott: The Woman Behind Little Women, The Alcotts". Nancy Porter Productions, Inc. 2015. ^ Brooks, Rebecca Beatrice (September 19, 2011). 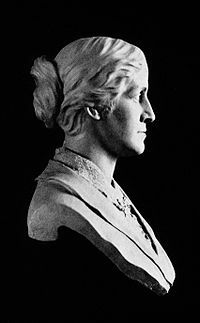 "Louisa May Alcott: The First Woman Registered to Vote in Concord". History of Massachusetts. Retrieved April 2, 2018. ^ Peck, Garrett (2015). Walt Whitman in Washington, D.C.: The Civil War and America's Great Poet. Charleston, SC: The History Press. pp. 73–76. ISBN 978-1626199736. ^ Stern, Madeleine B.; Daniel Shealy, eds. (1993). "Introduction". The Lost Stories of Louisa May Alcott. New York: Citadel Press. ISBN 0-8065-1654-2. Retrieved September 14, 2015. ^ a b Hill, Rosemary (February 29, 2008). "From little acorns, nuts: Review of 'Eden's Outcasts: The Story of Louisa May Alcott and Her Father' by John Matteson". The Guardian. Louisa succumbed to typhoid pneumonia within a month and had to be taken home. Although she narrowly survived the illness she did not recover from the cure. The large doses of calomel—mercurous chloride—she was given poisoned her and she was never well again. ^ Sands-O'Connor, Karen (March 1, 2001). "Why Jo Didn't Marry Laurie: Louisa May Alcott and The Heir of Redclyffe". American Transcendental Quarterly. Questia Online Library. Retrieved June 6, 2013. ^ Reisen, Harriet (2009). Louisa May Alcott: The Woman Behind Little Women. John MacRae Books. ISBN 0805082999. ^ "Introduction". Little Women. Penguin Classics. 1989. ISBN 0-14-039069-3. ^ Stern, Madeleine B. (1999). Louisa May Alcott: A Biography: with an Introduction to the New Edition. UPNE. ISBN 9781555534172. ^ Clark, Beverly Lyon (2004). Louisa May Alcott: The Contemporary Reviews. Cambridge University Press. ISBN 9780521827805. ^ a b c Lerner, Maura (August 12, 2007). "A diagnosis, 119 years after death". Star Tribune. Archived from the original on May 17, 2008. ^ a b Donaldson, Norman and Betty (1980). How Did They Die?. Greenwich House. ISBN 0-517-40302-1. ^ a b Hirschhorn, Norbert; Greaves, Ian (Spring 2007). "Louisa May Alcott: Her Mysterious Illness". Perspectives in Biology and Medicine. 50 (2): 243–259. doi:10.1353/pbm.2007.0019. PMID 17468541. ^ McGuire, Michael S. "Famous Last Words". Union College. Archived from the original on March 3, 2012. ^ Isenberg, Nancy; Andrew Burstein, eds. (2003). Mortal Remains: Death in Early America. University of Pennsylvania Press. p. 244 n42. ^ Reisen, Harriet (2009). Louisa May Alcott: The Woman Behind Little Women. New York City: Henry Holt & CO. p. 188. ISBN 0312658877. ^ Allen, Amy Ruth (1998). Louisa May Alcott. Minneapolis: Lerner Publishing Group. p. 22. ISBN 9780822549383. ^ "Louisa May Alcott". Boston Women's Heritage Trail. ^ "Louisa May Alcott Google doodle marks 184th birthday of 'Little Women' author - Search Engine Land". November 29, 2016. Shealy, Daniel, ed. (2005). Alcott in Her Own Time: A Biographical Chronicle of Her Life, Drawn from Recollections, Interviews, and Memoirs by Family, Friends and Associates. Iowa City, Iowa: University of Iowa Press. ISBN 0-87745-938-X. Cheever, Susan (2006). American Bloomsbury; Louisa May Alcott, Ralph Waldo Emerson, Margaret Fuller, Nathaniel Hawthorne, and Henry David Thoreau: Their Lives, Their Loves, Their Work. New York, NY: Simon & Schuster. ISBN 978-0-7432-6461-7. Elbert, Sarah. A Hunger for Home: Louisa May Alcott and Little Women (Temple UP, 1984). LaPlante, Eve (2012). Marmee & Louisa: The Untold Story of Louisa May Alcott and Her Mother. Free Press. ISBN 1-451-62066-7. Larson, Rebecca D. (1997). White roses: stories of Civil War nurses. Gettysburg, PA: Thomas Publications. ISBN 1577470117. OCLC 38981206. MacDonald, Ruth K. (1983). Louisa May Alcott. Twayne. ISBN 0-8057-7397-5. Matteson, John (2007). Eden's Outcasts: The Story of Louisa May Alcott and Her Father. Norton. ISBN 978-0-393-05964-9. Meigs, Cornelia (1968). Invincible Louisa : the Story of the Author of Little Women. Little, Brown and Company. ISBN 9780316565943. Myerson, Joel; Shealy, Daniel; Stern, Madeleine B. (1987). The Selected Letters of Louisa May Alcott. Little, Brown. ISBN 0-316-59361-3. Myerson, Joel; Shealy, Daniel; Stern, Madeleine B. (1989). The Journals of Louisa May Alcott. Little, Brown. ISBN 0-316-59362-1. Paolucci, Stefano. Da Piccole donne a Piccoli uomini: Louisa May Alcott ai Colli Albani, "Castelli Romani," LVII, n. 6, nov.-dec. 2017, pp. 163–175. Reisen, Harriet. Louisa May Alcott: The Woman Behind 'Little Women'. ISBN 0-805-08299-9. OCLC 316514238. Saxton, Martha (1977). Louisa May: A Modern Biography of Louisa May Alcott. Houghton Mifflin. ISBN 0-395-25720-4. 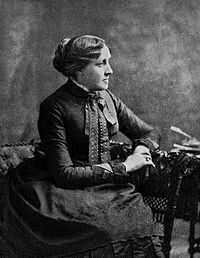 Wikimedia Commons has media related to Louisa May Alcott. The Louisa May Alcott Society A scholarly organization devoted to her life and works. 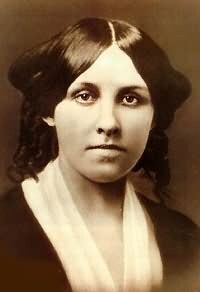 Louisa May Alcott, the real woman who wrote Little Women. Documentary materials. Louisa May Alcott's Orchard House Louisa May Alcott's Orchard House historic site in Concord, MA. Norwood, Arlisha. "Louisa Alcott". National Women's History Museum. 2017. Matteson, J. (November 2009). Little Woman; The devilish, dutiful daughter Louisa May Alcott. Humanities, 30(6), 1–6.